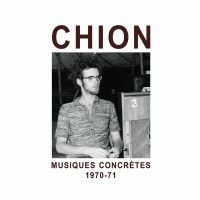 “Musiques Concrètes 1970-71.” Michel CHION: Blanche, Op. 7 (1971); Sonatine, Op. 2 (1970); L’Oiseau en cage, Op. 6 (1971); Le Ciel tremble, Op. 4 (1970); Habanera, Op. 3 (1970); Train de pianos, Op. 1 (1970); Étude d’après Beethoven, Op. 5 (1971). Brocoli 016 (1 CD) (http://www.brocoli.org/). Brocoli compiles Chion’s earliest pieces. Regardless of the name at the top of the bill, some of these command attention. Chion (b. 1947) created his Opp. 1-7 in his early twenties. He had done some work with Pierre Schaeffer, and was about to join the Groupe de Recherches Musicales (GRM). It’s evident he had fearless energy. A strict archivist might have sequenced these chronologically, but this order makes a dramatic design. Prepared pianos, and some that are simply out of tune, take center stage in the earliest works. Blanche, presumably the latest item, presented first, offers 12:24 of concrète without an apparent program. It is not evident how Chion got there so quickly. Chion’s Op. 1, Train de pianos, consists of 15 movements presented in an unbroken 33:18 span. The earliest acknowledged opus makes an impressive statement. It is unclear whether these are actually recordings of through-composed improvisations or pieces, or whether parts, or the whole, are to be perceived as concrète. The ambience changes between sections suggesting the collection was built up over time. Regardless, Chion captures the prepared piano’s magic, and additional studio transformation is not always necessary. We may be at the 1970s start, but the 1950 Henry / Schaeffer Bidule in ut pops into mind. The Op. 2 Sonatine compresses Train’s meandering into tight bursts. The three parts or movements pass in five minutes. Possibly, this piece could be played live by someone else, except that the variable acoustic here suggests multiple recording sessions which may be the giveaway that the Sonatine is actually concrète. Chion’s own worklist doesn’t credit a studio, but does indicate multiple pianos. The three-minute Habanera is enthusiastic juvenilia, featuring the composer himself cooing in falsetto over a simple accompaniment on an upright. Voice is more intimate than piano and with this work Chion begins to establish himself as an actor in his pieces. Of course his music wouldn’t exist if he hadn’t created it, but it also doesn’t exist without his specific participation as a performer. It is ambiguous whether we’re privy to live improvisation or something constructed to sound that way: We hear the walk between the tape recorder and the piano bench, and at the end, an abrupt termination. Another curator might have just as easily discarded the effort entirely. Op. 4, Le Ciel tremble, is billed as a melodrama, nearly 12 minutes of fantasy featuring a poem by Pascal Fleury (obscure or a pseudonym?). The reading is underscored with agitated piano (prepared again), guitar and other clumsy instrumental sounds. A Chion fingerprint appears: The same text is declaimed simultaneously in different styles to create tension, a pattern used to great effect in the Requiem (Op. 10, only a few years away in 1973). There are some electronic sounds. Eventually Chion would tell stories without relying upon narration. Three pieces are from 1971 (the first four date from 1970). L’Oiseau en cage, Op. 6, sounds like a bird in a metal cage, with the enclosure’s wires being strummed like a harp. There is overlaid playback manipulation which transforms the sound into a pinball machine. The two minutes could be a miniature theme and variations on a comprehensible sound. Or it could have been constructed from varied sources and assembled to simulate a bird in a cage. If L’Oiseau en cage focuses upon something explicit and descriptive, Étude d’après Beethoven, Op. 5, and Blanche, Op. 7, are truly concrète. Sources may be recognizable, but they are quickly transformed and arranged in unnatural ways. Neither seems to have a story, even though the Étude appears to start with an introduction. The digipak’s table of contents adds “d’après le début du 16e Quatuor,” but I have not been able to figure out how Op. 135 figures in to what grows quickly disturbing in just under four minutes. Chronologically we arrive at the sectional sequencing of eight moods and moments in Blanche whose sophistication is apparent even if predominantly obscure. There are prepared piano sounds which take us back to Op. 1. “Musiques Concrètes 1988-91.” Michel CHION: Dix Études de Musique Concrète, Op. 29 (1988; rev. 2007); Variations, Op. 31 (1990; rev. 2003); Crayonnés Ferroviaires, Op. 33 (1991). Brocoli 019 (1 CD) (http://www.brocoli.org/). Brocoli’s subsequent Chion tranche offers three mature pieces. Dix Études and Crayonnés are first releases. Variations appeared with Requiem (Empreintes Digitales, iMED 9312). The ten Études are virtuosic bits that do not easily yield. Even with the titles (“Toucher Présense,” “Phrases,” “Mots,” “Rêverie,” “Craquements,” “Rixe,” “Fonte,” “Ménage,” “Manège” and “Cantique”) it’s not clear what we are hearing. Rêverie isn’t particularly dreamy, Ménage isn’t particularly domestic. Chion may have selected field recordings that are intrinsically obscure, and then aggressively juxtaposed and layered them. These pieces were created using good old analog technology: reel-to-reel (or open reel) tape recorders and physical manipulation of tape. More on that below. For the record, in these Études I hear what sounds like sloppy painting or mopping, the zipper sound of unspooling adhesive tape, bubbles being created in water with a straw, someone hammering fabric onto a chair, etc. More conventional sources include a modest amount of water (poured, sprayed, dripped, etc. ), some resonant creaks, and a smattering of prepared piano. Rixe offers someone panting heavily as if being chased (or maybe something else), perhaps a cinematic outtake. Ménage eventually exposes a voice (probably Chion) declaiming “Écoutez!” The last étude, Cantique, the longest at just barely 6 minutes, feels a bit like a culmination, although it is perhaps similar to the others just operating at a larger, slower scale. Some sounds do reappear across Études but they do not seem to signify structure. Good concrète requires capturing intrinsically interesting material, then the technical skill to arrange it into something else. It is not necessary to puzzle out what we hear all the time, except that these Études seem wonderfully opaque. There are no explicit delineations, just fortuitous correlations and overlaps. It’s like being on a moving city bus, looking out the window and catching glimpses into houses and shops. Chion considers them austere, narrow and obsessive, a combination of wet and dry sounds. Perhaps all concrète is variations of some form or another. These Variations appear to be different manifestations of music in three-four time. Chion asserts that everything we hear stems from a waltz which never actually appears in its original form (perhaps we hear variations recorded on different instruments). Distortion plays a role and there are several venues (circus, café, etc.). Accustomed to hearing Variations after the Requiem, it surprises to encounter the piece here. After the formal Requiem, the retouched dances are a vivacious contrast. Following the ten Études, the Variations’ virtuosity stands out, as the same techniques are used to build a larger structure. Crayonnés Ferroviaires is a combination manifesto and reflection upon the gradual disappearance of night trains. Early on, Chion speaks the title and delivers an explanatory lecture, but the two words eventually become fetishized and treated like a concrète object undergoing truncation and simple playback effects. Yes, there are trains – one of the first concrète subjects – as well as prepared pianos. Maybe the prepared pianos are a security blanket, or a reliable starting point. Op. 33’s title refers to a technique Chion utilizes extensively which he calls “crayonné.” The less poetic “sonic overprinting” might be an explicit description: A tape with an existing sound can be manually erased or overprinted with a new sound by temporarily blocking the erase and record heads of a tape recorder or moving the tape away from the heads so that the material is not fully erased or recorded. This is a completely physical action involving dexterity as well as a bit of chance, as once the two recordings are interleaved, there is no separating them. Presumably, Chion achieved this effect with a pencil. Michel CHION: La Messe de Terre (1996; rev. 2014). Motus M614001 (1 DVD) (http://www.motus.fr/). I would hazard a guess that in his “Earth Mass,” Chion was trying something new. For a leading critic and theoretician of sound and image to attempt his own “liturgie audio-logo-visuelle” is risky if not brave. The 2:32:42 “figurative but non[-]narrative fresco” quickly establishes itself as personal and subjective, like an obsessive’s diary or the log book from an inconclusive experiment. This is not an easy place to start exploring Chion’s work. 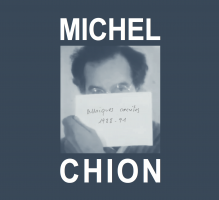 Motus includes Jérôme Bloch’s 22-minute film of Chion explaining the effort (in French). We see Chion’s hand-drawn map (also reproduced in the DVD case and on the disc). The 14 sections fall into two parts (Messe and Terre) separated by an Entr’acte (Messe: “Entrée,” “Une Vie,” “Quatorze stations,” “Kyrie,” “Vitrail,” “Gloria;” “Entr’acte;” Terre: “Credo,” “Chant de nuit,” “Genèse,” “Offertoire,” “Sanctus Benedictus,” “Agnus Dei,” “Communion”). Overall, the structure follows the Mass as indicated by title cards and subtitles. Sometimes the Latin words are intelligible, or will be declaimed and distorted in ways familiar to listeners of the 1973 Requiem. Sound and image do not often align, most sounds are non-diegetic. It can be hard to figure out what is going on, where we should be focusing. Perhaps some images are found footage, though most of what we see suggests home movies captured during a vacation. Some of the scenes are in a French-speaking country, some might be in the US (I recognized one way and stop signs). Benedictus briefly shows the inside of St. Peter’s Basilica in Rome. Most events are mundane city scenes. Sometimes it seems as if the camera is a new toy being employed for the first time. Objects move in and out of focus. The superimpositions, filtering and effects suggest someone determined to experiment with every feature in a software package. Video may be slowed, unexpectedly paused or looped, as if we are privy to the editing. Sometimes the titles are mirror reversed. We might hear the stuttering of a film projector. There are shots of an electronic music studio, and a tape reel being prepared. Techniques in the first half reappear in the second. For Quatorze Stations Chion finds 14 ways to frame the visuals, but the methods don’t directly translate into meaning and can be distracting. As a purely listening experience, it does not compare with Chion’s other works. Credo doesn’t vary the visuals very much, which suggests that the work is best experienced aurally. An earlier version of Gloria (1994) was released on Metamkine (MKCD 015) and does have elaborate images here. Credo Mambo (1992) was an early incarnation of the Credo and appeared on Metamkine (MKCD 004). A still from Vitrail is on the 1996 release of On n’arrete pas le regret (Ina-GRM 5005). Offertoire’s struggling speaker over typewriter sounds like it borrows from the Melchisedech character in Diktat (1979; Nuun Records). Chion folds in additional music from Messiaen (Trois petites liturgies de la présence divine), François Donato (Stare Libra Onis) and Schubert (Le Chant des Esprits sur les Eaux and the “Unfinished” Symphony). The credits nod to familiar colleagues (Dufort, Zanesi, Teruggi, Bokanowski).